Bethesda's The Elder Scrolls series has been catering to gamers' open-world fantasy fantasies since 1994, each new title dragging players deeper into the world of Nirn and its thick and hearty fiction. Now the fifth age of The Elder Scrolls is dawning, and Tamriel's need for heroes has never been greater. Should you heed the call? Mike Fahey, who literally peed himself the first time he played The Elder Scrolls: Arena: Sing with me, my friends! Dovahkiin Dovahkiin / Naal ok zin los vahriin / wah dein vokul mahfaeraak ahst vaal! Memorize this dragon tongue chant; it's the soundtrack for the next few months of your lives. It's what greets you when you first load The Elder Scrolls V: Skyrim, music building from a low rumble to a powerful shout that shakes the spirit in the moments between spinning up the game and pressing start. No matter how long it's been since you set foot on the continent of Tamriel, that music brings it all rushing back. The song stays with you, becoming your heartbeat as you wander the mountains and valleys of this latest virtual landscape. Even when you manage to drag yourself away from the screen it persists, popping up at the strangest moments, calling on you, the hero from another world, to don the mantle of hero once more. So I choose to spend the majority of my time chasing elk across the countryside, searching for interesting bits of scenery to jump off of, and attempting to climb up the sheer sides of Skyrim's tallest mountains simply because they're there. My coming was foretold, surely they mentioned my odd habits somewhere in the prophecy. When the legendary hero is needed I'll be there, with axe and fire and a voice so powerful as to send shudders up and down the spine of the world. I'll leave the technical points to Mr. Hamilton. He speaks the truth, and I'd rather not leave this cozy cocoon of fantasy the game has woven around me; at least not until next week's review. You'll see what I mean once the music begins to play. Dovahkiin fah hin kogaan mu draal! Yes. 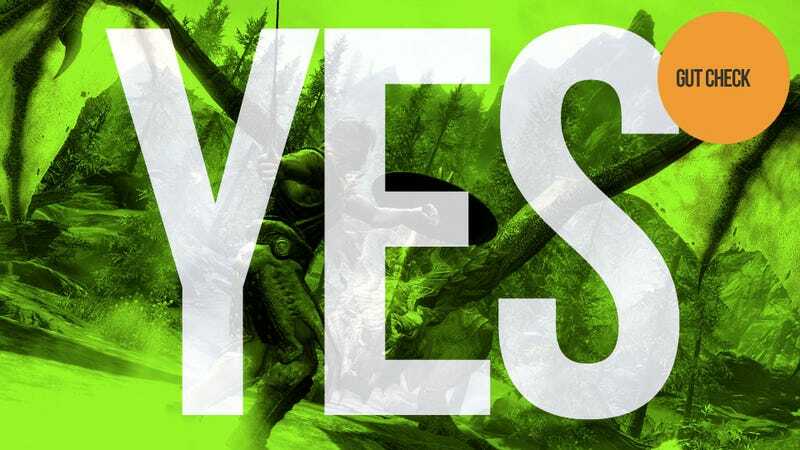 Kirk Hamilton, who seriously just shot a deer from like half a mile away: You're excited about Skyrim, I'm excited about Skyrim… we're all excited about Skyrim. Fortunately, after ten hours or so playing the game, I can report that all that excitement is entirely warranted. For starters, the game is as massive as advertised and then some. Often I'll start a session by spending five minutes just sort of moving my cursor around the map, gobsmacked. Skyrim is also welcomely difficult, and enemies don't level alongside you, so the world feels alive and toothy in a way that Oblivion's did not. It's still a Bethesda game, and despite the many improvements to the graphics (those mountains in the distance!) and animations (third-person perspective is usable! ), many parts of Skyrim on 360 retain the occasional ugly textures and jankiness of Oblivion and Fallout 3. But Skyrim is more than its graphics or its animations—this is a game about wanderlust. Take it from me: once you've wandered in Skyrim, you won't want to wander anyplace else. Luke Plunkett, who between 2006-2008 spent more hours in Oblivion than he did in the real world: I'm going to keep this brief. This is a new Elder Scrolls game. And despite the fact I'm yet to lay hands on the thing, my gut says this is a definite purchase. Why? Because this is a new Elder Scrolls game. There are no worlds more expansive in video gaming than those Bethesda crafts for these titles, so as someone who plays games for that very reason - to lose myself in a world and its artificial inhabitants - everything I've seen and heard about Skyrim makes it sound like a very easy, very loud Yes.